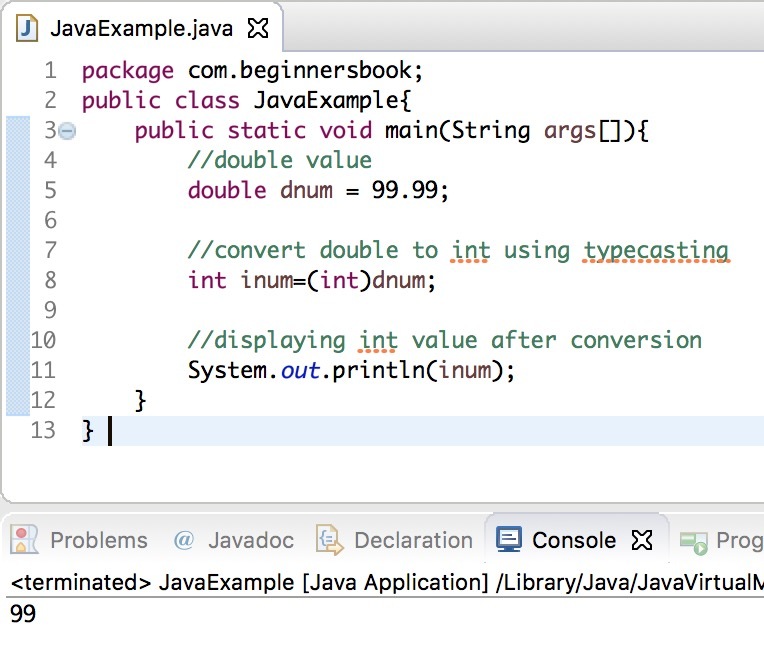 In this tutorial, we will learn how to convert double to int in Java. As we know double value can contain decimal digits (digits after decimal point), so when we convert double value with decimal digits to int value, the decimal digits are truncated. 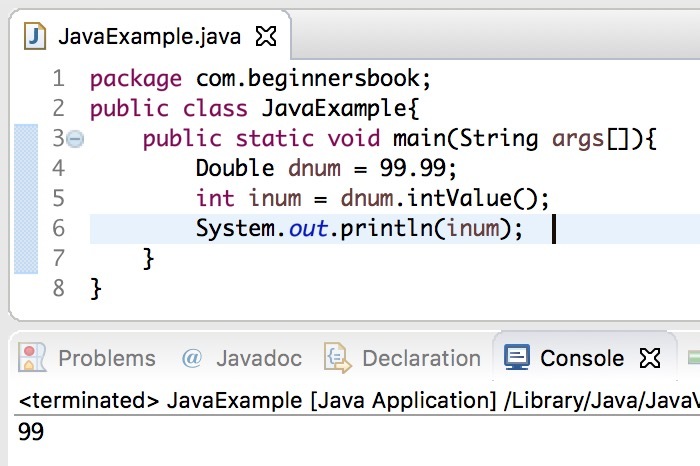 In this java tutorial, we will see three ways to convert a double value to int. Out of these 3 ways there is one way in which you can round of the double value to nearest integer value. 2. Convert double to int using Math.round() – This ensures that the decimal digits double value is rounded of to the nearest int value. To typecast a double value to integer, we mention int keyword in the brackets before the decimal double value. The only downside of conversion using typecasting is that the double value is not rounded of, instead the digits after decimal are truncated. We can solve this issue by using Math.round() method which we have discussed in the second example. 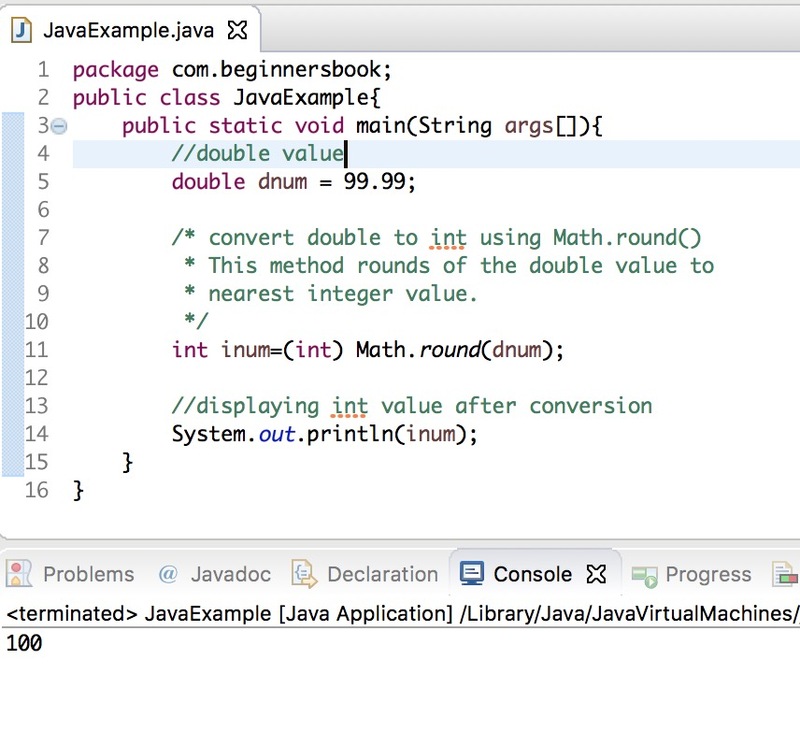 In this example we are converting the double value to integer value using Math.round() method. This method rounds of the number to nearest integer. As you can see in the output that the double value 99.99 is rounded of to the nearest int value 100. In this example we are using Wrapper class Double. This is same as typecasting method, where the digits after decimal are truncated.